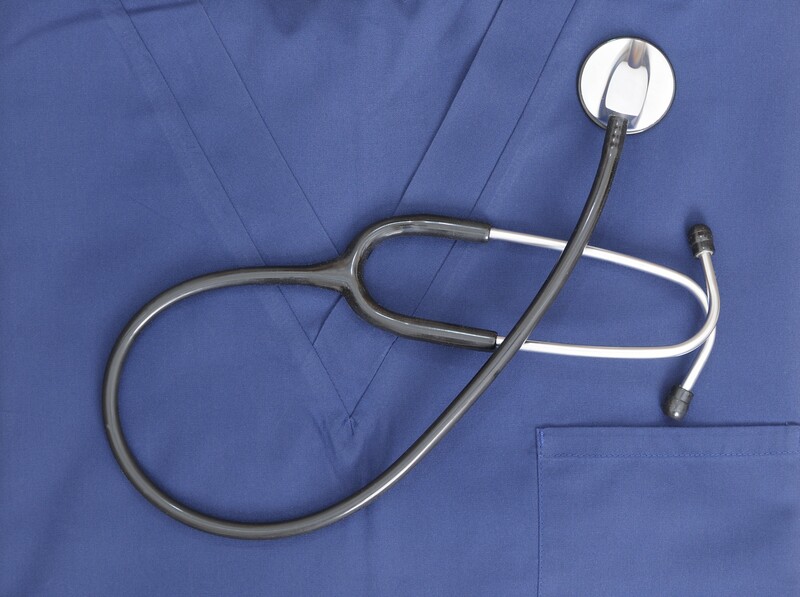 Scrubs are the sanitary clothing worn by hospital workers, nurses, doctors, and other staff. They're simply designed to minimize places for contaminants to lurk. There are several options when it comes to the fabric choices for scrubs. Many are made of 100 percent cotton. Cotton is the most durable. Other benefits of all-cotton scrubs are the softness, and the unlikeliness of embarrassing see-through fabric. All-cotton scrubs are more prone to wrinkle, and cost more than polyester blends, but they will stand up better to multiple washings. Other fabrics used for scrubs are polyester, polyester-cotton blends, and other synthetic fabrics such as rayon and spandex. It's simply a personal choice of the wearer, but the scrubs need to stand up to multiple washings, release various body fluids, and be sturdy enough to be worn many times. Scrubs need to be easy to launder and cheap to replace if damaged, or stained beyond repair. The nurse or staff who wants to purchase medical scrubs has multiple choices in fabric blends, colors, designs, and cuts. Some newer medical scrubs have incorporated synthetic blends that include spandex and rayon for those who need some stretch. Polyester-rayon blends are ideal for strength and cost effectiveness. The fabric for the scrubs needs to be comfortable to wear all day. Some scrubs in Dallas, TX, have blends that are luxuriously soft, and the design or cut is more flattering. The nurses and staff in a doctor's office often have custom embroidery on their tops with the name of the clinic or a logo. Some pants for scrubs have elastic waists, or yoga-style waists. Tops can have a V- or rounded neckline. They can have long or short sleeves. There are also scrub jackets with snaps or zippers. Some scrubs are very stylish with a mock-wrap-around top, or flattering princess seams. Surgical attire usually consists of a short-sleeved V-neck shirt and drawstring pants. No street clothes can show outside of the scrubs. Originally, operating room attire was white. It was considered the color of cleanliness. By the 1950s and 1960s, most hospitals had changed to colored scrubs due to eye strain from the bright lights reflecting off the white scrubs. You will usually see surgical teams wearing green, gray, or blue to reduce eye fatigue. It's believed that those colors are easier on the eyes. Scrubs come in many colors. Many hospitals choose the same color for nurses and workers on a particular floor or department. Some scrubs come in a variety of prints. You might see flowers on one top, and animal footprints on another. Nurses and staff on a pediatrics floor might wear cute prints that children can relate to. There are many options to choose from.